Good evening! Here in the Shenandoah today the sun was shining and only a slight skiff of snow was seen from our snowfall last night. I did not get called in to sub today so I had a few hours to stitch! I wanted to show you my newest project, Sara Schultz from Ginger and Spice. This is one of my "Santa Presents" and I am really enjoying stitching her! I bought the fabric and thread on Monday and have gotten a good start on her, I think. This is the pattern book. It says that the sampler is in the collection of the Reading Public Museum. Guess the next time hubby and I are in PA we will have to swing by and take a look at the REAL Sara! This is a closer shot of the sampler. I am trying to hurry through the letters so that I can get started on the beautiful motifs! Here are the threads...the picture does not do them justice. I chose 28 ct. Zweigart Antique Cashel Country Grain fabric and sampler threads Dark Chocolate (Gentle Art), Gingersnap and Toffee (Simply Shaker.) These colors remind me of a really good latte with an extra shot of espresso! YUM! Well, I am off to get supper ready and stitch a little bit more. I hope all is well with everyone and you have been able to find some time to stitch today! Till next time...Happy Stitching! Super nice start and love the colors. The colors do sound yummy!! I love your progress on the Schultz sampler!! ALL of the selections you received are awesome! Why do I love samplers so??? 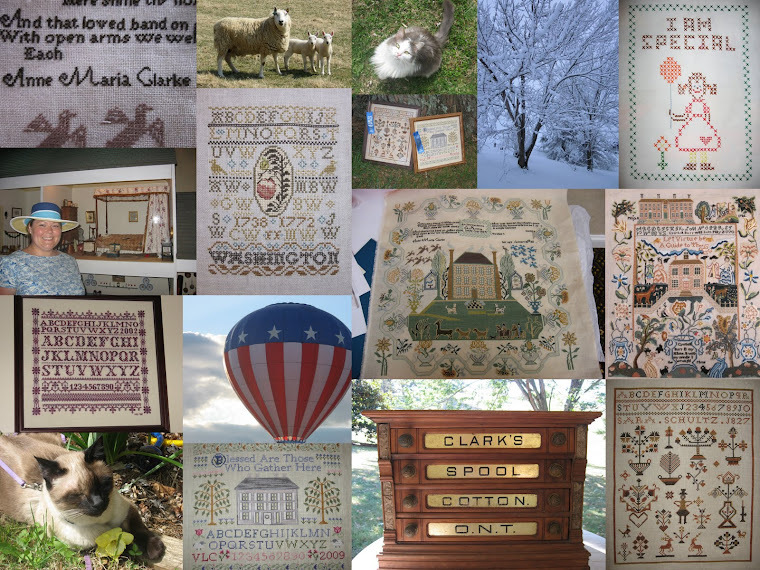 I know that the sampler threads are really gorgeous, it is impossible to get a photo that does them justice. Your sampler is going to be wonderful when it's done! Enjoy working on it!